One (another 'one'!) of my favourite sets, both before I had Terry Wise's book and after I'd got it. 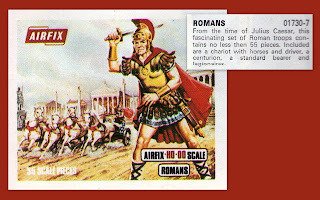 The epic movies on the flickering cods-eye by Cecil B. DeMille, The Christmas and Easter regulars like The Robe or Ben Hur coupled with what seems now, in hindsight, to have been an inordinate quantity of 'Roman Britain' taught in school, meant that a lot of us were a little bit Roman-barmy when we were kids! Being Totally unaware of the anachronistic hot-pants, I thought these figures were the bee's knees, although I was always annoyed by the fact that the poses were all so varied you couldn't line them up or 'block' them like they manoeuvred in the films and comics! Consequently, Terry's book (An Introduction to Battlegaming) induced much jealousy; that there were people who could afford so many boxes they had long lines of the same pose...or a whole squadron of War Elephants! 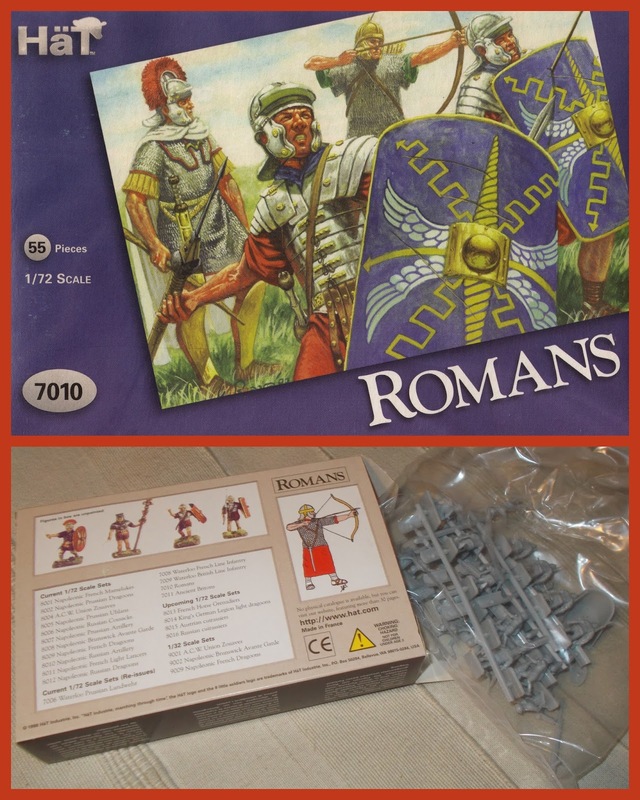 Variations in the 'Blue Box' for the Romans, there are other variations, they vary between print-runs, let alone the 'official' changes. Here we see a left-side window, centre-window and late no-window box, in the order they were released. Recognize the leather 'Hot-Pants'? This is the back cover of the Blandford Colour Series title; Warriors and Weapons 3000 B.C. to A.D. 1700 by Niels M. Saxtorph illustrated by Stig Bramsen and first published by Politikens Forlag. 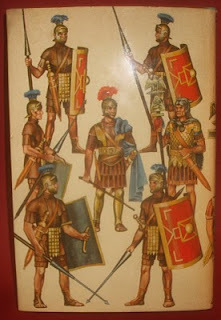 There is one further illustration of these leather segmented shorts - plate 126, for which the description is thus; "...the most common form of protection was a leather jerkin over a short coat of mail, metal re-inforced leather in front of the groin and short leather trousers...", he is describing the uniform changes in 100 BC. Peter Evans of Plastic Warrior Magazine's editorial team, also realized a few years ago that the leather hot-pant/kilts worn by this set were featured on the back-cover of the Blandford guide and did a bit of digging. It would seem Stig based the figure (in plate 126) on some historical image (a grave relief?) and the publishers then asked for some fillers for the back cover and he sent in the studies - for that other drawing - which they used as a collage/montage on the back of the book. The Airfix sculptor/artist then used the whole lot as the basis for his set presumably because he was too lazy to wedge the book open and use the more accurate pictures inside! Note also the similarity between the artwork and the Airfix figures' pilums? Blue Box artwork from the 1975 catalogue (courtesy of Kostas who supplied scans of the relevant pages), very atmospheric and bearing - it has to be said - very little relationship to the contents! The chariot looks more like Giant's, and the Centurion has come hot-foot from the Trigan Empire! 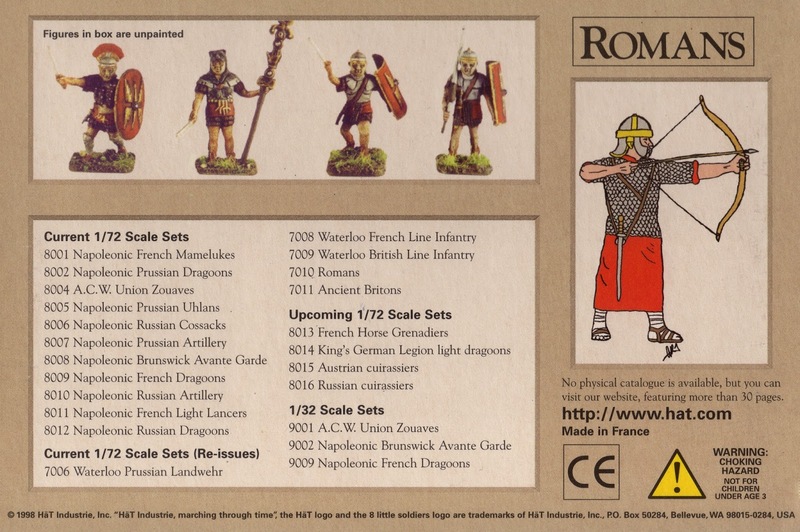 You get four of these in a full set, but you need at least 12 to make them look like Romans are supposed to look! The pilum (Wikipedia), with its weighted hand-grip was very well reproduced for the age in which these first appeared - in 1967 not even Elastolin with their 40mm figures were modelling them with such attention to detail, although it must be said that it's set too far down the shaft and looks more like a medieval lance! An interesting image, not from the point of view of the Romans per se, but rather: for the study of plastic figures in general. The lot on the right is an odd bag I bought at a show somewhere, only because it had a mass of shields (always a shortage of shields), the lot on the left was part of the Chase collection which went through Christie's and SAS about a decade ago. The lot stored for thirty-years in the humidity and heat of Florida have discoloured to a sandy-dun, and become as brittle as the biscuit they resemble. However, there was plenty of perfectly fine plastic in the collection, both hard styrene and softer ethylene's from around the world - including other Airfix sets, and US manufactured PVC. While the local conditions almost certainly contributed to the degradation of this lot which was probably bought at the same time (from the same production batch) for a war-gaming army, the fact that this problem wasn't collection-wide, or even Airfix-in-the-collection-wide, suggests my previous comments about plastic 'disease' being down to batches hold more water than other theories you'll find out there. There are four horses in two poses, paired with each other in such a way as to make four different mouldings from the two sculpts. 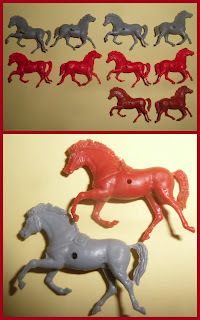 As the Ancient Britons were given the same horse and had a grey plastic production run, this shot is just helping those trying to sort loose sets, the Romans' have a larger receiving hole, which is sited both slightly forward and slightly lower on the flank of the horse. 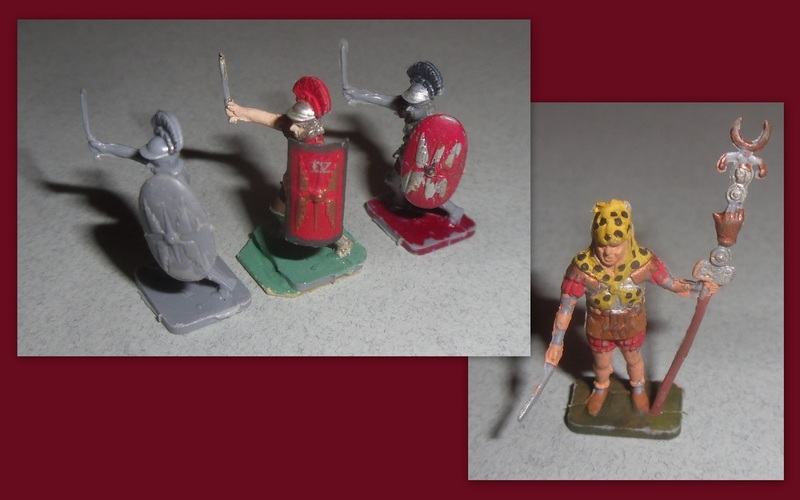 Three Centurion OBE's and a standard bearer I painted many many years ago! 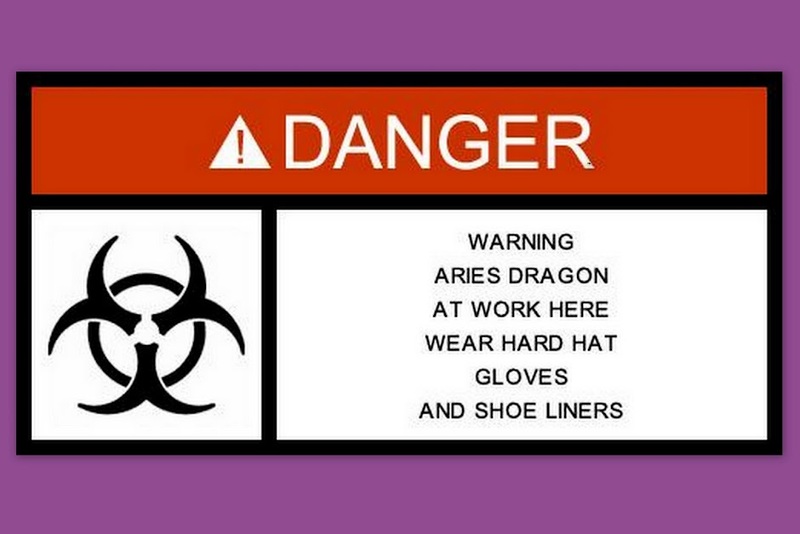 he is equipped with a signum, and we'll discuss (link to!) the four types of standard further down the page (while looking at the Atlantic figures). I had three and painted them as wearing leopard, tiger and bear-skins! More OBE's the middle five (pink faces) are from one collection and show how he differentiated his cohorts or maniples, to their left are four others from various collections, with three more to the right. The outlined shield looks quite different. The shield in the lower shots here is interesting, it was miss-moulded on the top right corner (bottom-right image) and the original owner (not me) has used - I suspect - nail-clippers to give the other three corners the same matching curved radius, the final effect being quite good. 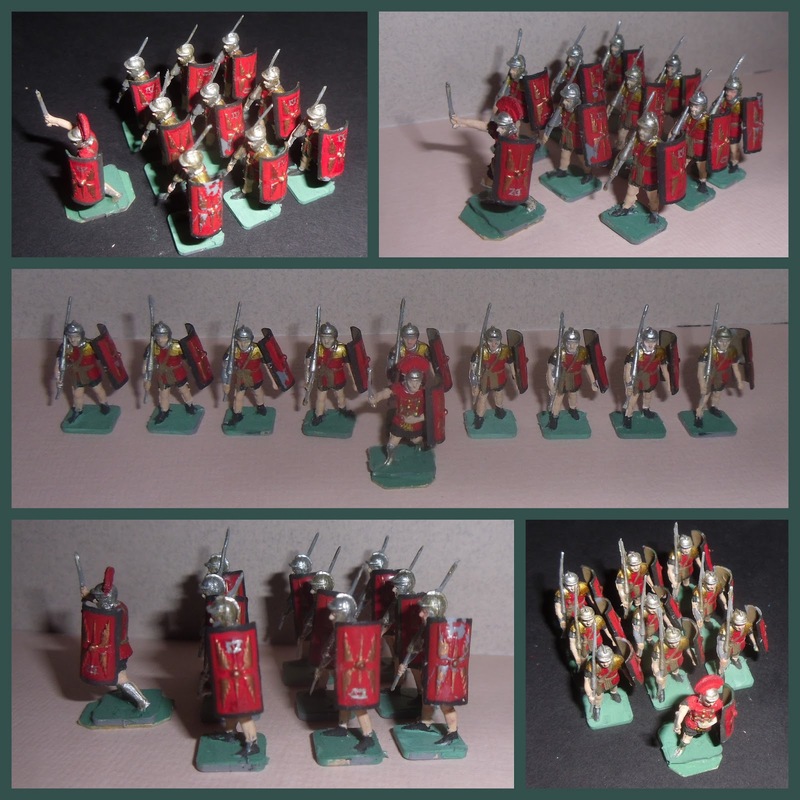 Above are some 'standard' old-school drawing-pin conversions, to make earlier or later legionaries than the typical 'Empire' era troops, or for use as auxiliaries or skirmishers in the same. The kneeling guy preparing to receive chariots or cavalry works very well. 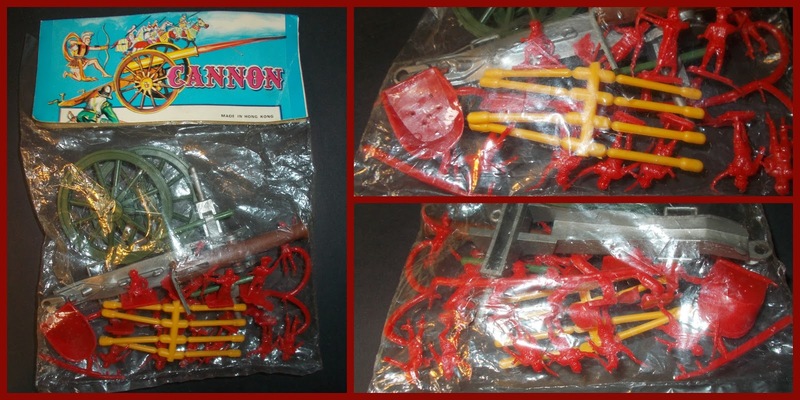 Hong Kong lost the plot totally with their attempt to pirate this set, stuffing a few figures on a runner and adding a cannon! Not just any cannon, but a cannon in another scale, and not just any scale, it's closer to the 60mm standard than 54mm! Presumably to knock them over, but why-oh-why; not a catapult? I have this set carded (above), bagged (below) and in various on and off-runner samples, including yellow and pink samples which I'll add here another day (as they are still in storage! ), and I have never seen these with wheels, or ponies? They go to all the trouble of making a copy of the chariot's body and the draw-bar, then don't give it wheels or motive power? Which means the two chariot crew are wasted too...nor have there even been any shields turn up, it's among the worst sets ever to come out of the New Territories! When you're on to a good thing (even if it's very very bad); rip the arse out of it...a few years later and this is on the local rack, same artwork and contents including the cannon, but bagged instead of being carded behind a blister. Complete set, sorters, for the use of. Issued in the standard Airfix 'neutral grey' for the first few decades of their existence, they have no real colour variation as far as the plastic goes. Silly pose award was given to the chap throwing a pilum is this set, it just doesn't work, it's like he's waving a giant foam toothpick in some televisual Jeux Sans Frontieres. With 28 soldiers in all, the separate shields and anachronistic chariot really knocked the figure total down here. 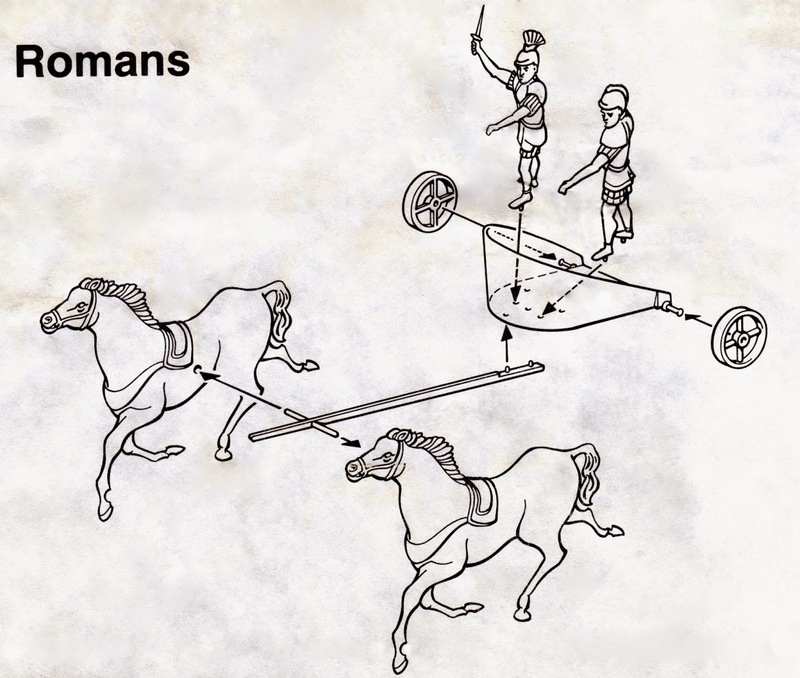 It's not that Chariots didn't exist, they did, but they were primarily a motor-car for very rich people in the cities, and flash-harry racers in the hippodrome, Italy in particular, and the ancient world's roads or landscape in general (outside of the plains of the 'fertile crescent') being unsuitable to such transport, especially as weapons...the Atlantic Greek Chariots being even more so, as they just didn't have them! 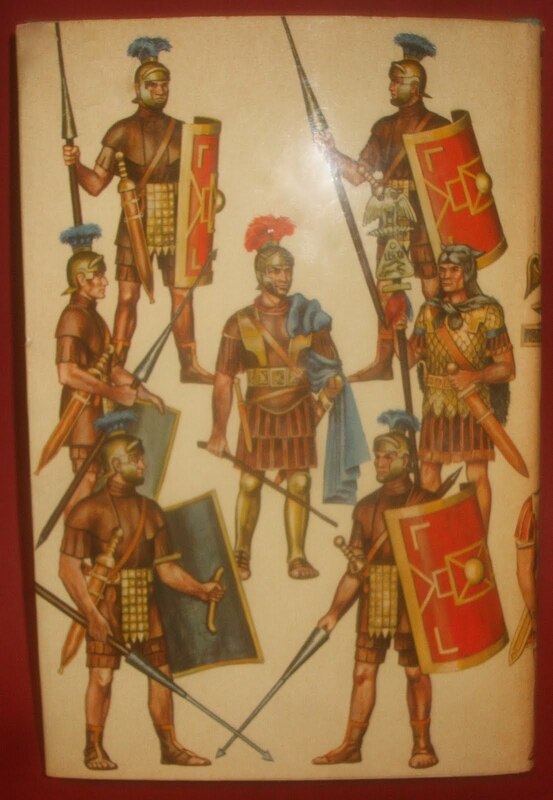 Major criticism of these figures has to be the Roman sword or Gladius, which on all figures are modelled as to be too short and not wide enough. 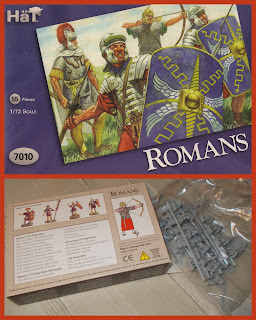 In the 1990's a sudden and unanticipated rash of re-issues saw the Romans released as part of a boxed set with the Ancient Britons and the Ceaser's Gate mile-fort, for which they got a fine shade of red plastic. A colour one felt they should have had all along...Hät Industries reissued them in silver at about the same time. Atlantic Romans in Egypt - a gratuitous shot of the unrelated Egyptian sphinx statues from Atlantic, along with a comparison with the same maker's Romans, they are really poor, some of the worst figures they did, painted-up they're not so bad, at they can be hidden in bodies of other manufacturers plastic or metal troops, but they're really awkward! They come with two different standards, both sorts of Aquila [Types of standard in the Roman Army] and useful - again painted-up and hidden among other figures, but the set as a whole is all sort of blowy? How can I put it? It's all cloaks, and over-blown crests and sticky-out scabbards and...'stuff', you can recognise the sculpting from some of the 54/60/70mm rubber, composition and early plastic figures coming out of Italy in the 1950's and 60's, but someone needed to get the sculptor to tone it down for 25mm, that archer....uurrggh! 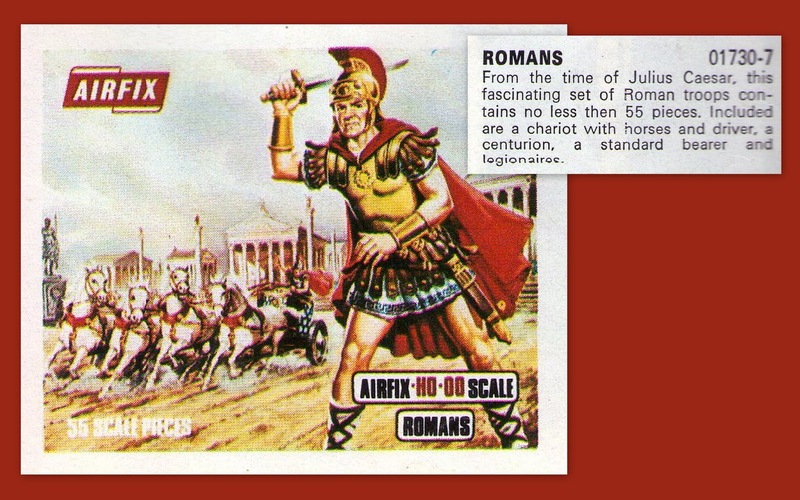 Avalon Hill's 'History of the World' was one of their later board games, and it came with a bunch of figures, two of whom can be fielded with or against the Airfix Romans, and both are reasonable matches, the Greco-Roman officer type being particularly useful as a command element, would also pass as a late Macedonian, Successor or Carthaginian. 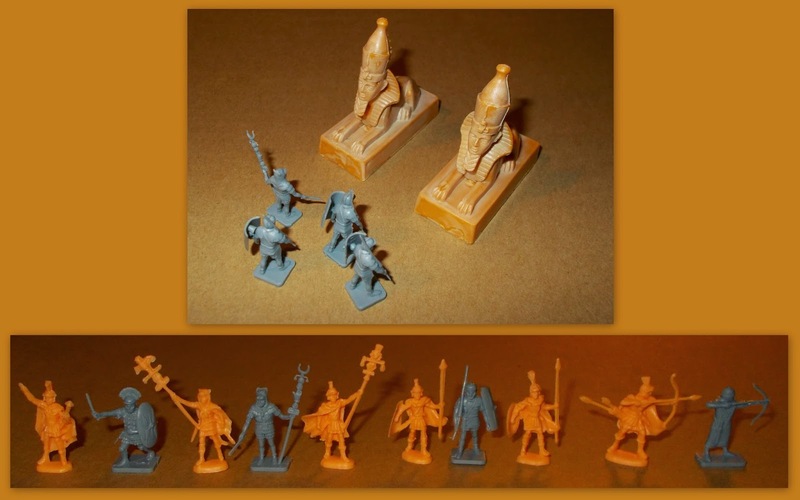 The Sumerian; hiding his bronze-age credentials behind the properties of being sculpted in this scale, can be enemy, local levies or allies or even an ad-hoc plebeian skirmisher, recruited in hurry during some emergency threatening the city! 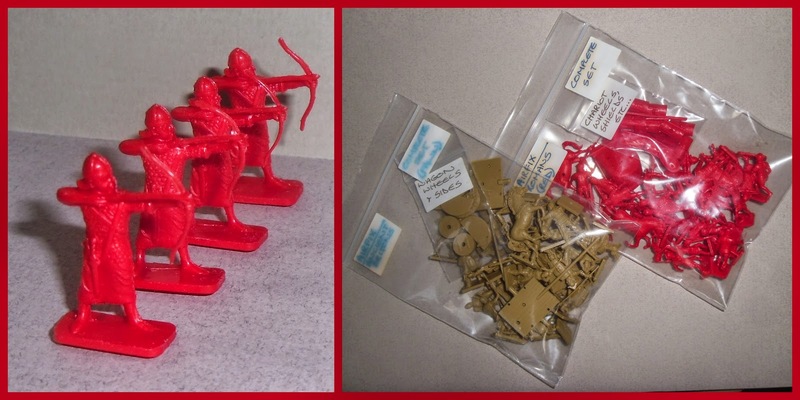 Sadly, despite the number of figures in the box, Avalon Hill only made the two sculpts. Quaker / Tom Smith Gladiators, given away with breakfast cereal, then Christmas crackers, and absolutely the best enemy for the Airfix Romans, they may well share a sculptor, they have identical base designs, are the same scale, and while one of the criticisms of these figures from rivet-counters and moaning-minies over the years has been that "they don't look much like gladiators", the army of Spartacus was an army, not a display team. 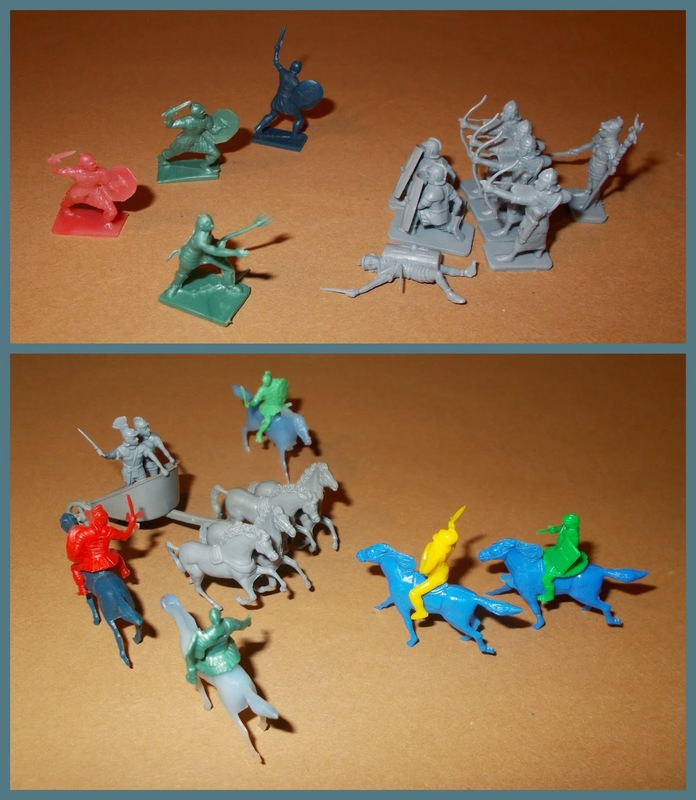 It included slaves, mercenaries, deserters and other ner'do'wells, was equipped from the units and armies it defeated, old stocks of the local citizen militias and the like and would have fielded troops looking just like the five foot and three mounted sculpts in this set. Indeed, if one needed a criticism: It's that two of the figures look too-much like gladiators...the marching with trident (and throwing invisible net!) and mounted with full murmillo helmet. 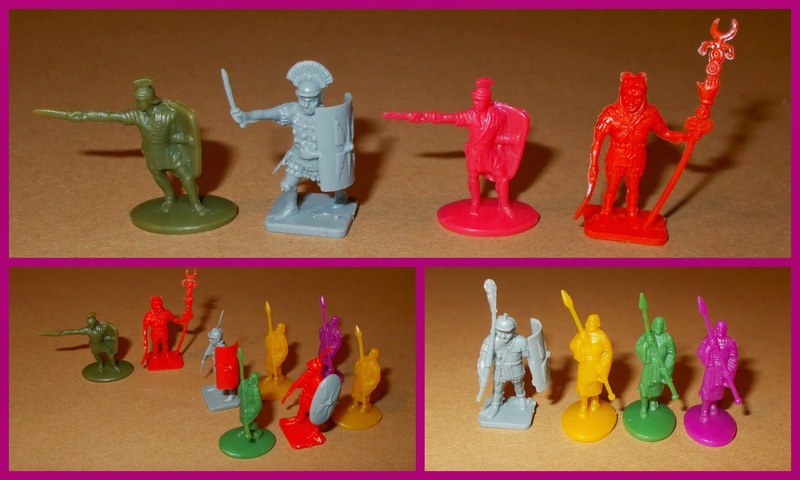 Looked at on the main blog here - G is for Gladiators and by PSR here - Cereal Gladiators and they're NOT Kellogg's! 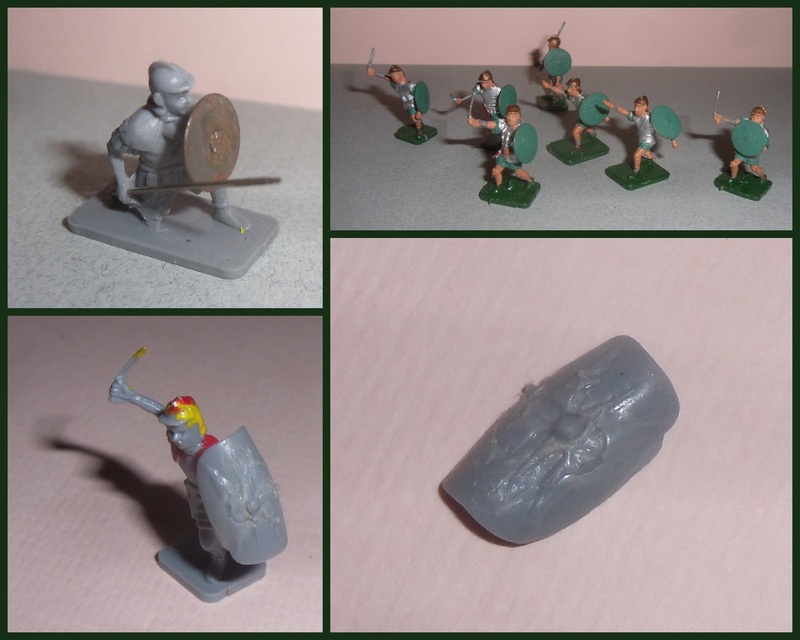 Aurora issued these six sculpts - two ships officers, two Marine/Infantry commanders and two steersmen - with their model kit of a Roman Bireme, a double oar-decked warship. It was stated as being 1:80th scale, and the figures reflect that by being a tad smaller than the Airfix (nominally: 1:76th scale) figures. 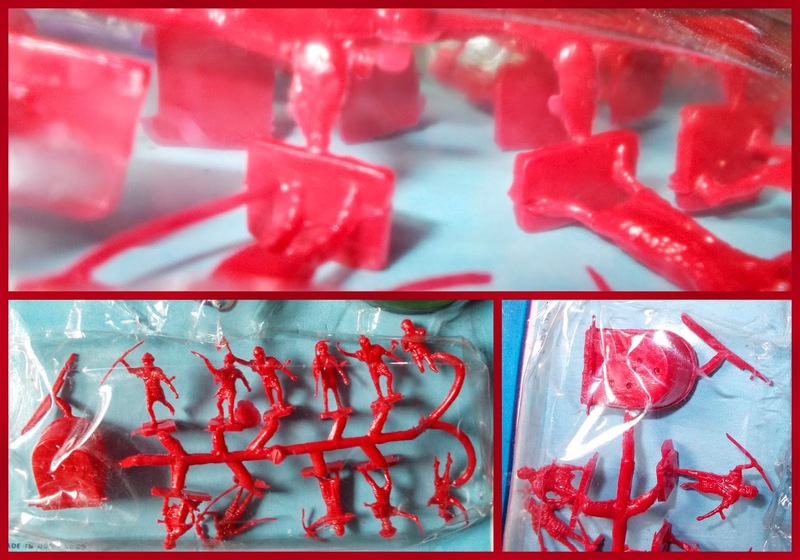 There were duplicates of some of the officer poses for a box count of ten, maybe 12 figures...I'll put the correct total up when I next get the box out. 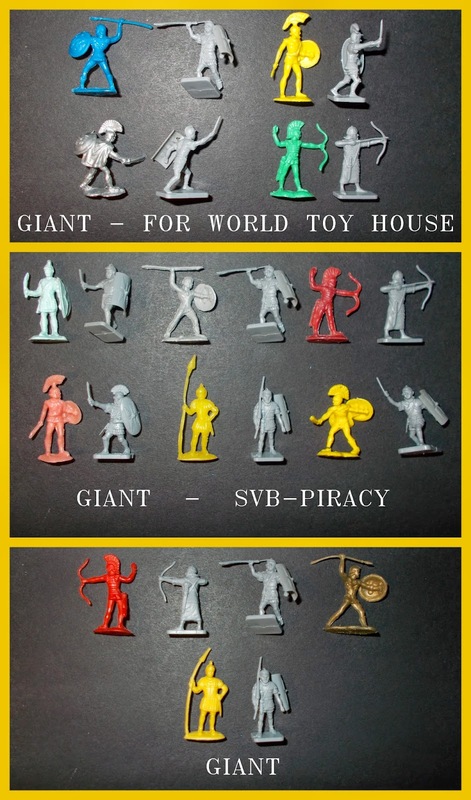 A line-up of archers, as a size comparison. The Atlantic archer from the Greeks, being a darn-sight better sculpted than their Roman effort! Rospaks were 25mm war gaming giants on heavy bases while the Esci chap is a good match, and with the Hong Kong / Giant stuff, it's hit and miss; the better figures being bigger, the blobbier sub-piracies are the better match! Instruction sheet from the recent (1990's) play set re-issue. The earlier artwork (Blue Boxes) for the Chariot always showed it assembled, clearly Heller/Hornby thought that modern kids need a hand placing the elements, while managing to lose two horses in the CAD studio...! I guess/suppose thought, that with two horses it could find its way onto the battlefield as a General's battle-taxi, the four-horsed Quadriga being the racing-car of the day. Back to Giant, and their closer copies. 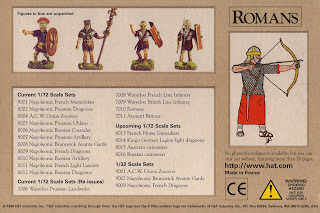 Now I have got the Hong Kong Romans page going I should get comparisons of them all done? But this gives a good enough Idea of the general fit, which is not too bad, but the HK troops tend to be a bit larger and/or taller than the Airfix bods. 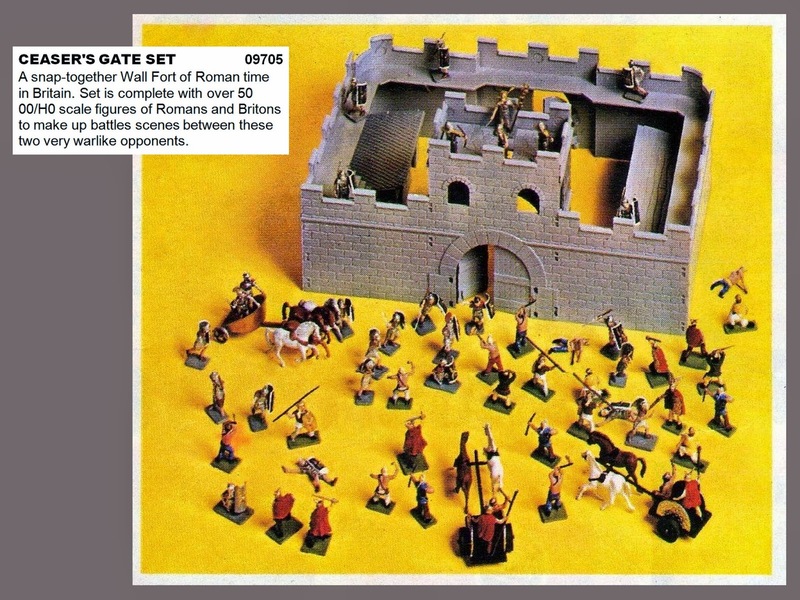 Ceaser's Gate: the play set for the twin sets; Romans and Ancient Britons, a great favourite with us back in the day. Made a nice Keep for later conflicts too, if you didn't have Sherwood Castle or one of the Marx forts! The best bits were the two internal stand alone structures (barracks/stables). This and the 2nd image following are also from the scans Kostas sent me. The whole set in all it's glory...well, it had a bit more glory in 1960-something, before it's corners got a bit dog-eared and the very-thin vac-formed tray chewed itself with age or bordom, but you get the picture. Unlike the US concept of 'Playsets' (in all scales), the UK (or more generally: 'European') 'play set', tended to only have the two belligerents and a building or large scenic piece of some sort, there are no trees, fences, stores, tents &etc. as you would expect to find in say a Marx Miniature Masterpiece set, but that didn't matter, 18 little shields and four wattle'n'dawb cart (sorry - 'Chariot') sides to fiddle with was enough for us! 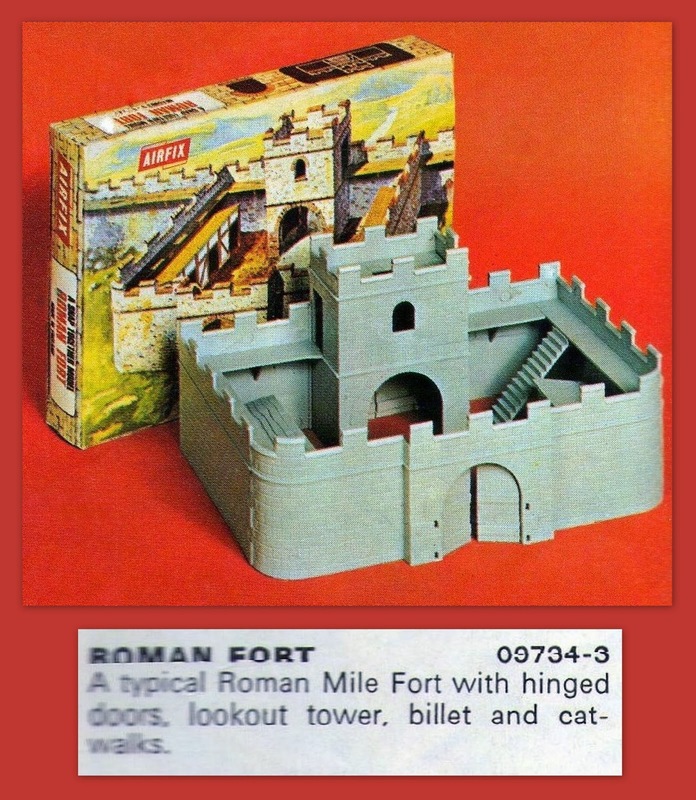 The fort was also available as a stand-alone piece for any figures you might have kicking around already, so your gloss-silver WWII British Infantry could storm it and the black-clad SS-men inside if needs be, or it made a nice elephant house at the Zoo!...while the two useful 'in' buildings could be added to the Airfix French Waterloo Farmhouse as out-buildings! There's something slightly disconcerting about that image, despite lots of horizontal and vertical parallel lines, it appears to be leaning slightly? Maybe it's the white background in 'edit'? Checks 'preview'...no it isn't!